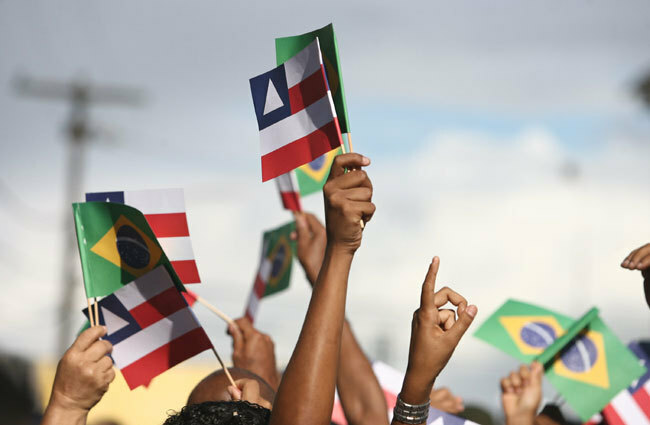 On May 8th, 2013, Bahian Independence Day, which falls on July 2nd, was officially recognized by the Senate as a date of national importance in Brazil. The recognition doesn’t mean it will become a national holiday but the date does hold an important place in the hearts of Bahians. While Dom Pedro I was shouting “Independence or death!” on the banks of the Ipiranga river in São Paulo, the war for the independence of Bahia against the Portuguese military was in full swing. In actuality, it not only ended after Brazil was declared independent but it begun before the fight for Brazilian independence had started. The Bahian efforts, in the end, were what sent the Portuguese packing. In fact, Bahian people are proud of July 2nd because it symbolizes the real fight for independence (and not just a mere proclamation of it), where they not only shed a lot of blood and tears, but where slaves and those of native indian descent (caboclos) came together to aid in the fight. It is also where they found themselves outnumbered, by three-thousand Portuguese soldiers versus one-thousand five-hundred on the Brazilian side, and still ended up victorious. In 1822, the royal courts in Lisbon ordered Portuguese commander Madeira de Melo to take control of Bahia in light of Dom João VI’s return to Europe almost a year prior. The rumors, and later knowledge, that his son, Dom Pedro I, would not return to Portugal brought about Madeira de Melo’s appointment. With the start of 1823, Portuguese reinforcements arrived in Salvador, dominating the city. Dom Pedro I, then, sent in Brazilian troops, who eventually had to fall back into the Recôncavo region outside the capital city. (Important to note that “Brazilian” here means fighting for Brazil, since almost all the troops actually doing so were Portuguese-born). Surrounded and with food and ammunition running out, Madeira de Melo requested more Portuguese troops from Europe. It was then that Dom Pedro I sent in the French general and mercenary, Pedro Labatut, to expel the enemies. Labatut had previously participated in the Napoleonic Wars, as well as alongside Simon Bolivar in Colombia. It’s somewhat ironic that a Frenchman would push the Portuguese out of Brazil since it was due to the French invasion that the Portuguese went to Brazil in the first place. In the Battle of Pirajá, which was a defining moment in the fight for Bahian independence (and, ultimately, that of Brazil), Madeira de Melo took the offense and ended up getting injured. One account of the battle relates the story of a soldier who, while being Portuguese but fighting for the Brazilians, confused the Portuguese troops by giving the sound for them to advance according to a specific battlefield scenario. The only problem was the scenario wasn’t actually happening so instead of advancing, they fell back, at which point the Brazilian troops attacked, winning the battle. The Portuguese retreated to the city center and soon found themselves weakened, tired, low on firepower, and with a Brazilian fleet (with an Englishman at the command) all but surrounding them seaside. Madeira de Melo and the remaining troops finally fled the country, returning to Portugal while being chased all the way back to Lisbon. The day that Labatut and his men took back the city was July 2nd, 1823.